There are many, many silicone, rubber and 'natural' shoes around, all of which purport to be better for the feet than conventional footwear but in my opinion end up looking a little odd. Here is another spin on that trend, this time from a Spanish company called 01M OneMoment. The inspiration for the shoe comes from Amazonian tribes who dipped their feet in latex rubber. 01M OneMoment is essentially a latex sock which is moulded to the foot protecting it while allowing for comfort and air circulation. 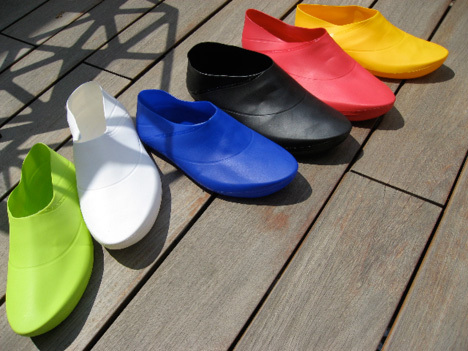 The shoe is also environmentally friendly as it eventually wears down and degrades to nothing. As they have an extremely thin sole, I'm not sure how much protection they actually offer but as they retail at a fraction of the cost of other ergonomic footwear, they may be worth a try.